The arrival of June may kick-start vacation or summer jobs for many students, but the turn of the calendar this month means it’s finally time for two University of Bridgeport (UB) students to send their research project to the International Space Station aboard a SpaceX spacecraft. Last fall, UB biology majors Feissal Djoule, of West Haven, CT, and Emily Juliano, of Shelton, CT, competed to take part in the Student Spaceflight Experiments Program, an initiative of the National Center for Earth and Space Science Education (NCESSE) to support student-proposed research conducted in a low-gravity environment aboard the International Space Station. In January this year, Djoule and Juliano learned that their project, one of more than 1,959 proposals that had been submitted to the NCESSE for consideration, had been selected for the prestigious program. 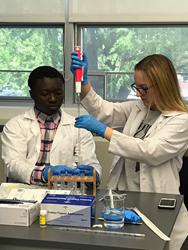 Djoule and Juliano are being advised by Dr. Isaac G. Macwan, a research associate at UB’s Department of Biomedical Engineering. The research focuses on changes in cellular proteins in order to increase understanding of questions that have been asked possibly since the beginning of space exploration: What are the effects of space flight on human health? How does it affect the body’s biological processes? Can anything be done to ameliorate potential damage? To make the comparison, astronauts will simultaneously conduct Djoule’s and Juliano’s research project aboard the Space Station while the two students do the same at one of UB’s labs. More specifically, both groups will combine mammalian cells with graphene carbon dots, minuscule carbon particles that are no bigger than five to seven nanometers in size. If all goes as expected, the carbon will begin to mark proteins in the cells. That, in turn, will create a mechanism for researchers to observe cellular changes and other processes, such as delivery of drugs into cells. The experiment is expected to run for two to three weeks. Funding for some of the research was awarded to UB from the Connecticut Space Grant Consortium. The Student Spaceflight Experiments Program is a program of the National Center for Earth and Space Science Education in the U.S. and the Arthur C. Clarke Institute for Space Education internationally. It is enabled through a strategic partnership with DreamUp PBC and NanoRacks LLC, which are working with NASA under a Space Act Agreement as part of the utilization of the International Space Station as a National Laboratory.